Ebola has quickly become a dreaded household word. 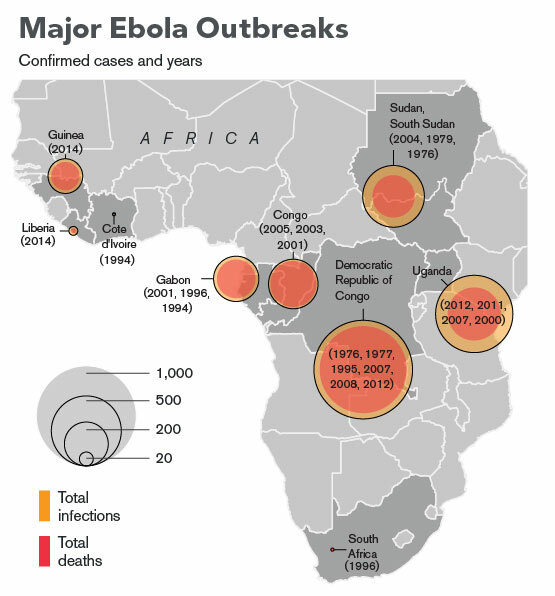 In my blog, Ebola—The Deadliest Disease Known to Man . 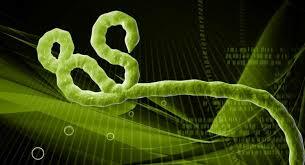 . . Is In America, I explained some of the most recent developments in the Ebola outbreak. But there is panic in the air, and the best way to dispel fear in this case is with truth. You need to know what all of this means for you and your family. As was the concern from the start, the hype surrounding Ebola gained a great deal of traction among those who enjoy sensationalizing the outbreak at the expense of accuracy and information. This has left many of my patients confused in a time when they want to protect their families and need to know what to expect. In an attempt to calm people’s fears, the Center for Disease Control (CDC) and the World Health Organization (WHO) have downplayed the epidemic, indicating that there is nothing to fear and we should all just calm down. Unfortunately it looks bigger than that from the outside looking in, which makes most of us even more fearful. We don’t know who to believe. 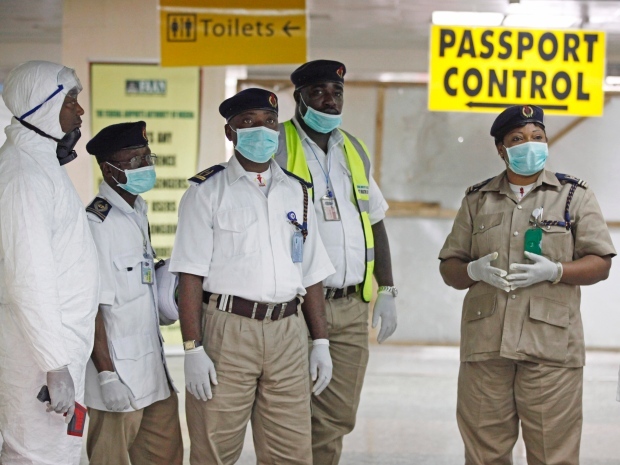 As a physician who travels to Africa many times during the year, and is intimately involved with the precautions that are underway in our state, I am closer to the inside than most. So let me pull back the curtain a bit and let you take a closer look. Here is the question: Just how worried should we be, and what precautions do we need to take in order to protect our families? Ebola is a hemorrhagic viral illness that has been contained for many years to several small countries located in West Africa. The virus takes anywhere from 8 to 21 days from the time of exposure to the onset of symptoms. Those symptoms include fever over 101.5 degrees Fahrenheit, with severe headache, muscle pain, vomiting, diarrhea, abdominal pain, and unexplained hemorrhaging from mucous membranes. It kills more than 90% of its victims. In the past, closing off contaminated villages contained outbreaks until the virus ran its course. With the ease of modern-day travel, it has become more difficult to isolate, and the virus has escaped these relatively isolated regions. Ebola is known to spread by direct contact with a person or animal with active infection. It can also be contracted with exposure to body fluids of an Ebola victim, or with heavy air contamination with Ebola droplets (such as being in close contact with someone who coughs or sneezes). Ebola also survives on hard surfaces such as countertops and door knobs for up to a week. Many of these symptoms can also occur with common, easily treated infections, and with the important exception of uncontrollable hemorrhaging, we see such symptoms often in our medical practices. How then do we distinguish these conditions from Ebola? The CDC has recommended that health providers test any such persons for Ebola, and isolate them in an appropriate facility as well. So far, 8,500 people have come in contact with currently infected individuals. The Chain of Transmission is currently being followed by a process called Contact Tracing to find those individuals and determine where they are and if they have fallen ill with Ebola. This makes is difficult to determine what will happen since we don’t know where all of those individuals are. There is no proof that Ebola has become airborne, but studies performed by scientists in Canada show this to indeed be the case. Even though it has not been independently verified, every precaution is currently being taken by the CDC to prevent any form of spread (including airborne) and we are working closely with them on a daily basis. 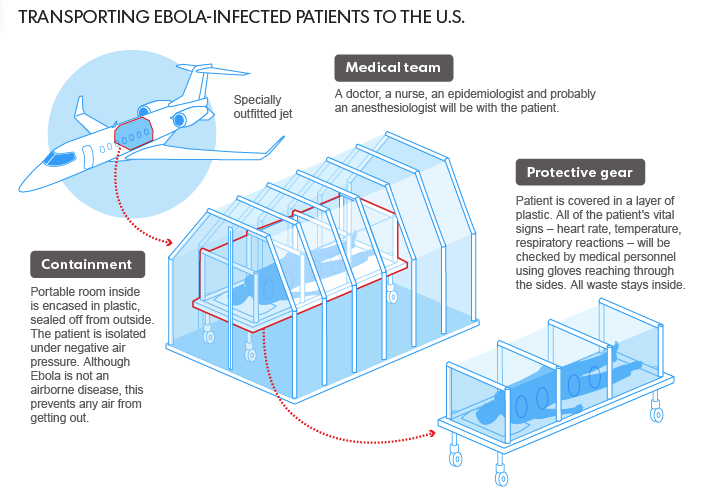 Although two American Ebola virus victims have been flown into the United States, the method of transport was state-of-the-art isolation. The diagram below outlines the precautions taken to prevent any chance of spread of Ebola to others. It is important to note that there have been no cases of Ebola reported in the United States other than the individuals flown to Emory in Atlanta. There is currently no epidemic in this country, and there is no pandemic (worldwide spread of disease) of Ebola. That being said, the CDC is working with the World Health Organization and other agencies to prevent the spread of this dreaded virus. For persons with a high-risk exposure but without a fever, testing is recommended only if there are other compatible clinical symptoms present and blood work findings are abnormal (i.e., thrombocytopenia [low platelet count] <150,000 cells/μL and/or elevated transaminases) or unknown. Persons considered to have a low-risk exposure include persons who spent time in a healthcare facility where Ebola patients are being treated, or household members of an Ebola patient without high-risk exposures as defined above. Testing is recommended for persons who develop fever with other symptoms and have unknown or abnormal blood work findings. Persons with fever and abnormal blood work findings in absence of other symptoms are also recommended for testing. Asymptomatic persons with high-risk or low-risk exposures should be monitored daily for fever and symptoms for 21 days from the last known exposure and evaluated medically at the first indication of illness. This encompasses a very small number of individuals. Persons with no known exposures to Ebola but who have fever with other symptoms and abnormal blood work within 21 days of visiting Ebola-affected countries, or feel they may have been in contact or close proximity of someone with Ebola disease or with someone who may be suffering from Ebola should be considered for testing if no other diagnosis is present for their symptoms. Testing may be indicated if fever is present with other symptoms mentioned above, and blood work is abnormal or unknown. Consultation with local and state health departments is recommended, and the local healthcare physician reports any suspicious cases immediately to the health department and CDC. These programs, along with isolation of ill patients (including screening of air-travelers), state-of-the-art treatment, and newly developed vaccines will be implemented only if needed. Precautions are being prepared, but they will not be implemented unless there is a true epidemic – and currently there is not one. There is currently no need to avoid public gatherings or stay indoors. There is no reason you should not travel and enjoy the things you would normally do this time of year. Ebola is not lurking around every corner, and is not spreading through shopping malls, schools or football games. For now we are taking precautions, setting programs in place in the unlikely event of an emergency, and developing new treatments and vaccines for Ebola. Don’t believe all the doomsday warnings.